Juventus beat Atletico Madrid 3-0 in the second leg of their Champions League round of 16 encounters at the Allianz Stadium. Cristiano Ronaldo scored a fantastic hat-trick to fire Juventus through to the next round. Twitter couldn't keep calm after this and hailed the Portuguese as the ultimate GOAT of football. In the first half, Juventus started with brilliant intensity and scored first through a brilliant header from Cristiano Ronaldo after he was found with a fine ball from Federico Bernardeschi. Atletico then were able to come back into the match and create a few chances of their own. Alvaro Morata in the dying moments of the first half missed a huge chance after he saw his header go wide of the post. In the second half, Ronaldo scored another goal and it was another brilliant header after Cancelo found him with a brilliant cross from the right. Then, Atletico tried to get back into the game, but then Bernardeschi went on a brilliant run and was brought down in the box and Juventus had a penalty. 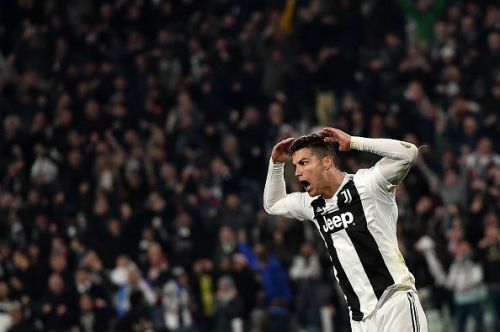 Up stepped the man of the moment, Ronaldo thumped Juventus to a 3-0 advantage. It was 3-2 on aggregate and the Bianconeri just had to hold on to their lead with minutes to go. Juventus did just that and with brilliant game management, saw the game off and gave us another memorable Champions League comeback this year. This year's Champions League knockout stages has been all about comebacks and it was another one at the Allianz Stadium and this time, it was the Old Lady with a memorable one. Cristiano Ronaldo has scored 23 goals in 33 appearances vs. Atletico Madrid. Cristiano Ronaldo has now scored 23 goals against Atletico Madrid in all competitions; he only has more goals against Sevilla (27). Ronaldo does what Ronaldo does. GOAT. Cristiano owns the knockout stages of the CL. The guy is unbelievable! Appreciate Cristiano Ronaldo while you can because we will never see another player like him ever again. This man is 34 years old and is still delivering incredible performances at the biggest stage in world football.